Dan appeared on Good Morning America today to discuss a Texas murder case who alongside host George Stephanopoulos and fellow legal analyst Nancy Grace. In Lubbock, Texas, Dr. Joseph Sonnier III was found shot and stabbed in his home last Wednesday. 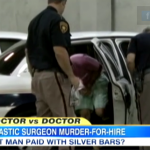 It is thought that another doctor, west Texas plastic surgeon Dr. Thomas Michael Dixon, paid a man named David Neal Shepard $9,000 (in the form of three silver bars) to kill Sonnier for dating his ex-girlfriend. Dr. Thomas Michael Dixon and David Neal Shepard were arrested by police in Amarillo shortly after midnight on Sunday. 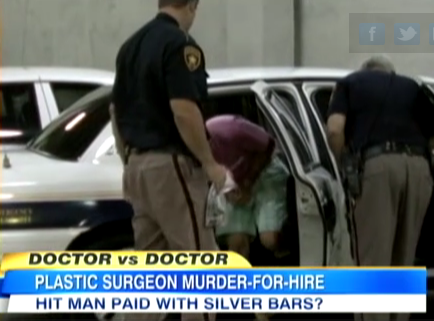 The silver bars gave him away — each one has a personal ID number that linked to Dr. Dixon and Shepard. The other crack in the case? Shepard spilled the beans to his roommate, who took the details to authorities. “They’ve got quite a trail,” says Nancy. Dan adds, “In all of these cases, people forget I think, that there are no such things as professional hit men — it tends to be you have to go to the guy next door, who you happen to know, and as a result these cases fall apart based on people talking, and that’s what allegedly happened here.” So what is the defense in this case? The doctor will point the finger at the hit man and say it wasn’t him – but the bars, the motive, and other links will tie it back to him, Dan believes, continuing that they will most likely be tried separately. Nancy also predicts the death penalty: “This is Texas, people,” she adds. Watch their segment here.